Wireshark is a free and open-source packet analyzer. It is used for network troubleshooting, analysis, software and communications protocol development, and education. 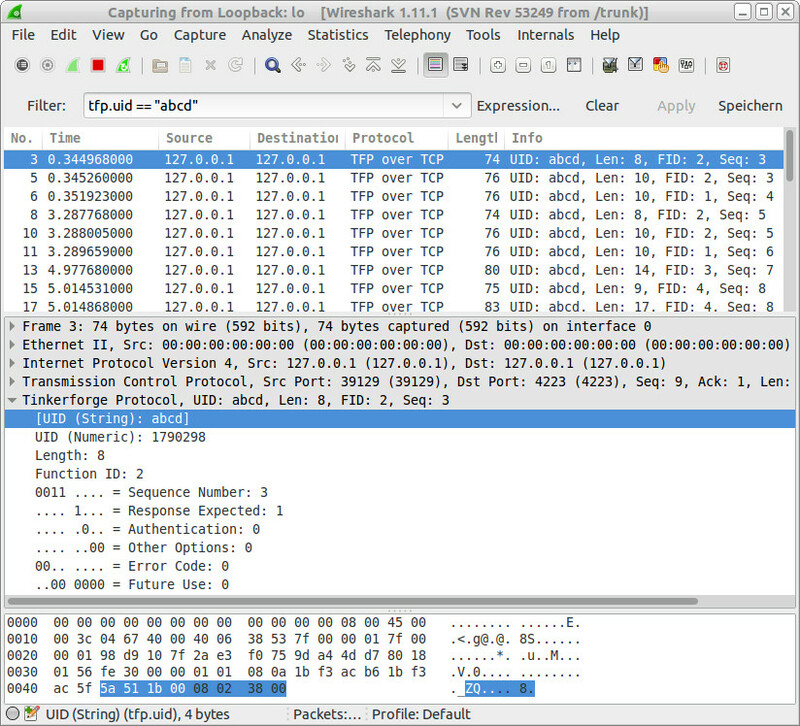 A Wireshark dissector is a plugin for a specific protocol. With the TFP (Tinkerforge Protocol) dissector it is possible to analyze the protocol that is used between Bindings and Brick Daemon (TCP/IP) as well as the protocol that is used between Brick Daemon and Bricks (USB). The dissector can assist in debugging bugs in the bindings and brickd. It is also very helpful while creating new Bindings. The dissector itself is also available on GitHub. Display filter for all of the fields in the TFP packet are available.